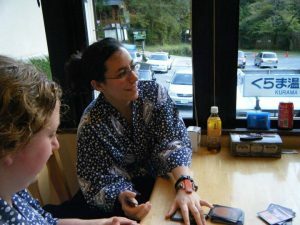 This entry was posted in Japanese, Library News, libspotlight, LIS Staff Interest, lisblog, Middlebury Community Interest, middpoints, Post for MiddNotes, Post for MiddPoints, Throwback Thursday on November 2, 2017 by Katrina Spencer. 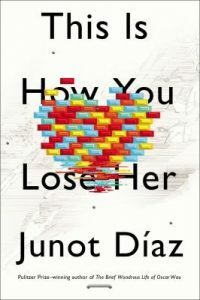 This entry was posted in Davis Family Library, LIS Staff Interest, lisblog, Mexico, Middlebury Community Interest, middpoints, Post for MiddNotes, Post for MiddPoints, Spanish on October 5, 2017 by Katrina Spencer. October is Disability Employment Awareness Month. Come to the Davis Family Library atrium October 2nd- 15th to see our display that includes books and DVDs that touch on a variety of themes related to disability. Also read below about the various efforts made to make our campus more accessible and inclusive. Many sincere thanks to Marlena Evans for her work in designing this month’s banner and to the Advisory Group on Disability, Access, and Inclusion for its generous guidance. 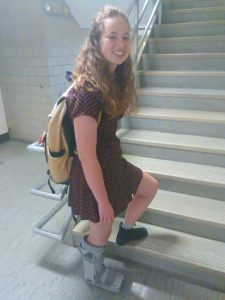 Junior Feb Ruby Edlin, from Hoboken, New Jersey, poses on the stairs wearing a medical boot meant to heal a former injury. At least one of her classes requires her to use the stairs. We’re interested in disability access, inclusion, and full-participation. Why does disability awareness and inclusion matter? BK: Because good design should accommodate everyone; one size does not fit all and variety is the spice of life. CC: We (society) were supposed to have understood that separate is not equal a number of years ago, we are still fighting to see that concept realized; awareness helps to move toward inclusion. Inclusion matters because every body and difference adds value to our society. We will all likely be disabled someday: it’s only a matter of time for some of us; others live it every day. ZS: Because designing systems to accommodate people with disabilities is often easy, but only if it’s planned from the start of the project. Changing things afterwards is often a lot harder; hence, it’s important to be aware of potential issues all the time and not wait for someone to make a complaint. KS: As we continue to make our societies better for everyone, including those belonging to historically marginalized populations (racial, religious, sexual, etc. ), disability must be treated with thoughtful attention, too. Disability is certainly intersectional and affects every color and creed. When we improve access, it helps broad swaths of the population and hurts no one. Give us an example of improved access here at Middlebury that you want others to know about and why it matters. 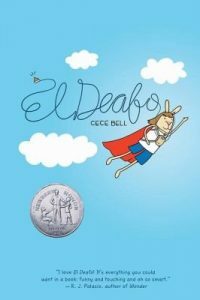 Featured here is the book cover image used for Cece Bell’s 2014 graphic novel El Deafo, a memoir that traces the author’s childhood experiences with deafness. This is one of the works to be featured in the October display. BK: The College has subscribed to Sensus Access (go.middlebury.edu/sensusaccess/), which is a web-based, self-service application that allows users to automatically convert documents into a range of alternate and accessible formats. The service has been used hundreds of times the last couple of years, which suggests there is need for such a service and prompts us to reflect on additional ways to improve access. CC: The College has added a second ADA Coordinator to Student Accessibility Services. Prior to that move, this was an office of one. The addition of this position allows two people to assist with access while the College continues to grow towards inclusive programs. This has allowed Student Accessibility Services to grow and provide additional programs, trainings and resources for students and faculty. KS: When I started working here, I noticed that questions asked at the Research Desk could develop into conversations that lasted 15, 20 or even 30 minutes. I recalled that when I was a graduate student, I found it very uncomfortable to participate in research consultations having nowhere to sit, so I requested a stool be made available for lengthier conversations. It was a subtle change, but one for the better. What are some resources to learn more about disability access and inclusion? 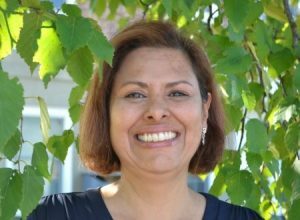 BK: Understanding the principles and concepts behind Universal Design for Learning (UDL) will benefit anyone promoting disability access and inclusion at Middlebury College. UDL on Campus is a great resource on course design, materials and policy. 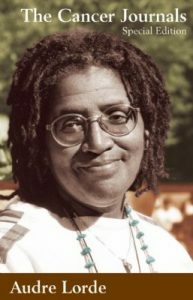 Pictured is the cover art used for Audre Lorde’s 1980 autobiographical experience of breast cancer, The Cancer Journals, a work now on order for the Davis Family Library, also to be featured in the October display. 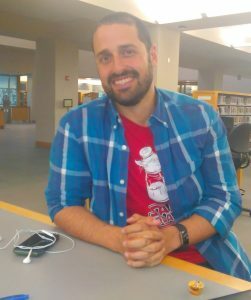 ZS: I find that listening directly to people with disabilities has been really enlightening. There are a number of online communities where people are willing to share their experiences, and I’ve also learned extremely useful terminology like the curb-cut effect and the social model of disability. KS: I recently learned that Middlebury has a Disabilities Studies Reading Group that has been meeting since 2009. Its first meeting this fall will be Thursday, October 12th, 7:00 p.m.- 8:30 p.m. in the American Studies Lounge, Axinn 242. For more on this, contact Susan Burch at sburch@middlebury.edu. In what other ways might we forward disability access, inclusion and full participation? BK: Seeing accessibility and inclusion from a social model rather than a medical model lens requires a mindset shift. Education is key in facilitating this shift. In the era of information technology, there is a wealth of resources available to individuals who want to learn more and people on campus ready to assist in the exploration. 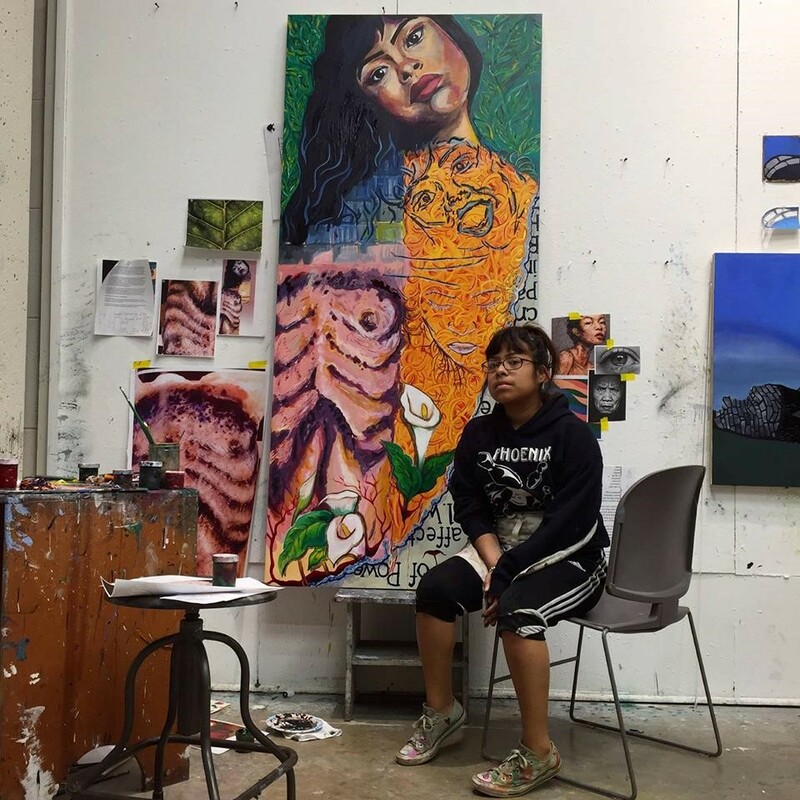 CC: Shifting our Middlebury culture to a place where disability is celebrated as an identity, rather than something that needs accommodation would be a large step toward thinking about disability as part of diversity and inclusion. Each department, academic and operational, could own access in that department by seeking information and suggestions for ways in which events, classes, courses, and programs could be more inclusive to all. I would love to see student groups celebrating disability, access and inclusion and current student groups asking about how to ensure their events are accessible to all, including students with disabilities. ZS: Classroom policies could be more focused on core pedagogical goals. Will students really not be able to learn the material if tests are untimed? If they can take notes on a laptop or record the lecture? If instructors make a note of sensitive material so people can mentally prepare themselves for it? Inclusion can be built in from the start. The ADA office is great, but for every student who’s already gotten a formal diagnosis, worked with them, realized what situations will come up in a course, and asked for specific accommodations, there’s one who hasn’t (yet) but could benefit from a little proactive thinking so everyone can fully participate in the course. Literatures and Cultures Librarian Katrina Spencer and Director of Reference & Instruction Librarian Carrie Macfarlane pose at the Research Desk where a stool has been installed to improve access. KS: Last semester I went to visit a foreign language class in Munroe Hall that was held on the third floor. I was carrying graphic novels with me at the time to share with students and had to haul them up three flights of stairs. I asked for an elevator and didn’t find one. 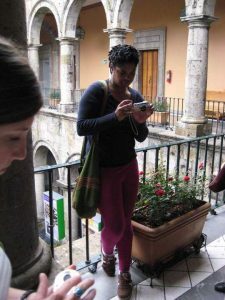 This is when I realized that stairs can actually be a barrier to access for learning, working and creating community. How do we determine which buildings are accessible and which are not? How do we make our campus accessible to all? If you have more ideas for how to improve access on and around our campus, or want to know more about disability access and inclusion at Middlebury, write to the Advisory Group on Disability, Access, and Inclusion at agdai@middlebury.edu. Also see the libraries’ lib guide dedicated to disability studies, developed with and maintained by Librarian Amy Frazier. This entry was posted in access, accessibility, American Disabilities Act, diasbility, display, inclusion, Library News, libspotlight, LIS Staff Interest, lisblog, Middlebury Community Interest, Post for MiddNotes, Post for MiddPoints, Sensus Access on October 2, 2017 by Katrina Spencer. Apple recently released a new iOS version for use on iPads and iPhones, iOS 11. You may experience difficulty connecting to Middlebury College email hosted by Microsoft when using the native iOS Mail and Calendar Apps. ITS recommends you use Outlook for iOS available free in the App Store. Apple and Microsoft are working on a solution. This entry was posted in Apple, Helpdesk Alert, Mac, Middlebury Community Interest, operating systems, Post for MiddNotes, Post for MiddPoints on September 22, 2017 by Cynthia Slater. 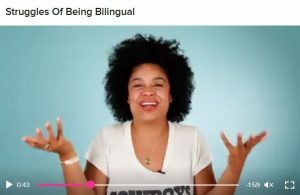 This entry was posted in Caribbean, Hispanic, Latin America, Latina, Latino, Latinx, libitsblog, library, Library News, libspotlight, LIS Staff Interest, lisblog, Marlena Evans, Middlebury Community Interest, middpoints, Post for MiddNotes, Post for MiddPoints on September 18, 2017 by Katrina Spencer. The ACTT has been evaluating MIddlebury’s services for video streaming. This summer, Middlebury has adopted Panopto, a service to manage and distribute video in a private space, as part of the solution. Panopto provides Middlebury faculty, students, and staff with a space to upload and sort their media, and share with their colleagues and classes. Panopto not only provides flexibility for who can see a video, it also includes a variety of sharing options. Some of these options include the ability to sync with presentations and other media, and providing a space to discuss video. In addition to the media management features, Panopto also provides services for capturing media directly from your computer or mobile device, with a direct upload to your Panopto space. Panopto has features that allow you to record and sync presentations (PowerPoint, KeyNote), screen captures, video and audio. Some possible use cases include: students assigned to record themselves as they practice presentations with slides, then and sharing these recordings to a class-only folder for peer feedback; creating brief instructional or tutorial videos based on tasks using specialized software recorded directly from your screen to be shared with students and colleagues. We have created a welcome page with links to curated Panopto resources, such as a quick start guide, at http://go.middlebury.edu/panoptohelp. Panopto also provides extensive documentation, with written instructions and video demonstrations. We have already implemented integrations between Panopto and the Course Hub, Canvas, WordPress and Drupal that allow for the embedding of single videos and playlists. Panopto has recently developed deeper integrations with Canvas that will allow students to submit Panopto media as an Assignment Submission, and allow you to provide feedback to students using the SpeedGrader. Look for announcements in Canvas as these features become available. We will be moving away from a number of media hosting solutions, including MiddMedia and Muskrat, over the next few years. We will share more information as planning for the migration projects proceeds. This entry was posted in Enterprise, Middlebury Community Interest, middpoints, notes, Open, Post for MiddNotes, Post for MiddPoints, projects on August 18, 2017 by actteam. 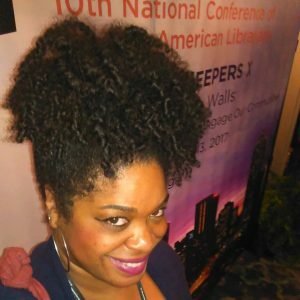 Katrina poses in front of the National Conference of African American Librarians’ banner. 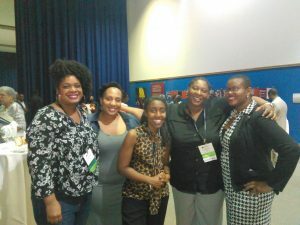 Middlebury’s Literatures & Cultures Librarian Katrina Spencer attended the National Conference of African American Librarians (NCAAL) in Atlanta, Georgia. See a brief video from the opening session shared on Twitter and read more coverage of the event in American Libraries’ Magazine. OMG, great! I feel like this conference was Middlebury’s personal gift to me. It fed my soul, which was hungrier than I expected. For the first time ever, I actually got to stay on site where the conference I was attending was being held. That makes a huge difference– to not have to catch a taxi, bus or train to the conference site and navigate inclement weather/downpours of rain, and also to be able to retire to one’s room to take breaks between sessions was a blessing! There were beautiful people in the city. Beautiful black people. With braids, twist-outs, locks… And it was the first time that I’d seen black and white people voluntarily spending time together on such a scale. 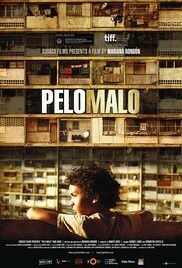 When I’ve seen this in the past, it has been rather exceptional and episodic. There I saw people from both groups treating each other fraternally. I can’t say I was expecting that and I can’t say, after 30 years, that I’d seen it before as such a normalized part of a landscape. But, to see that and to juxtapose it with the news from Charlottesville, Virginia is mind-boggling. Progress in terms of racial politics in this country, to say the very least, is spotty. 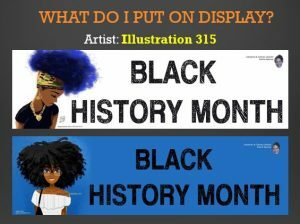 With much help from Davis Family Library’s Marlena Evans, the banners to be used during the February 2018 Black History Month display have been designed. Katrina’s presentation posed the question, “What do I put on display?” and encouraged librarians to think critically about their choices. What was your presentation on? The title of my proposal was “What I Wish I Would Have Known” and referred to my education on black history and blackness as a child growing up in Los Angeles in the 1990s. 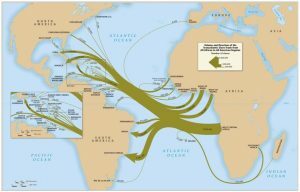 Succinctly, the Transatlantic Slave Trade impacted almost the entire Western hemisphere, not just the United States; the struggle for civil rights and social justice did not end in the 1960s; and black peoples are not defined by the violent scenarios and oppressive societies we encounter, yesterday, today, or tomorrow. Katrina (far left) poses with librarians and archivists who all graduated from the University of Illinois, Urbana-Champaign, with library and information science degrees. 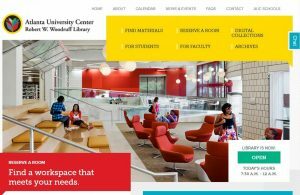 A screenshot from the Atlanta University Center’s Robert W. Woodruff Library website. I visited historic and cultural sites, for example, the Auburn Avenue Research Library on African American Culture and History and the Atlanta University Center’s (AUC) Robert W. Woodruff Library that serves Clark Atlanta University, Morehouse College, and Spelman College. I also spent time with several alums from my library and information science alma mater, the University of Illinois, Urbana-Champaign. Clark Atlanta University, Spelman College, and Morehouse College are all served by the same library. The AUC’s archives currently hold Dr. Martin Luther King’s briefcase. Malcolm X wrote postcards home from Lebanon and signed them “El Hajj Malik El Shabazz,” also held in the AUC archives. Despite the fact that many HBCUs are suffering in terms of securing funds to properly maintain their grounds and facilities, the AUC is tremendous, popular, and well maintained. There’s a published book of photos on Muhammad Ali’s life and fights that weighs over 70 pounds! A copy is held in the Auburn Avenue Research Library’s archives. The library and information science field is more intimate than you might think! 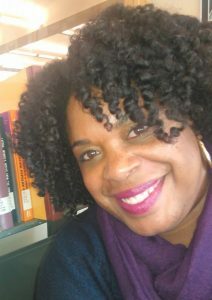 Black librarians are interested in revamping the ways in which we teach about black history. Tom Joyner is famous and funny. And he says he met his wife in a library. BCALA is interested in recruiting new members to its body. Were you inspired to pursue new projects? Come up with any news ideas? 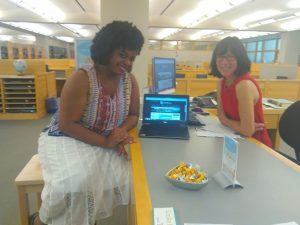 First, diversity recruiters Leo Agnew from the University of Iowa and Kathryn Kjaer from the University of California, Irvine, were essentially looking for ways to recruit and retain people of color within their libraries at their respective institutions. As someone from that target demographic, I have thoughts, strategies and insight I want to share with them. Second, I learned that BCALA publishes its own seasonal newsletter, BCALA News, in which, among other pieces, literary works are reviewed. I’ll pitch an idea to the editor. 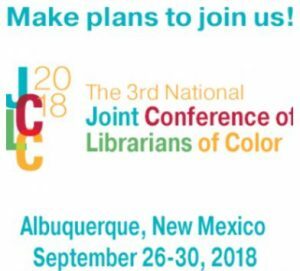 Third, in every conference bag, there was a save-the-date type of invitation to 2018’s Joint Conference of Librarians of Color. I wasn’t aware of the meeting but now I want to attend. Anything you might do differently next time? It would be great to have my presentation entirely prepped before departing for the conference site so that when I’m there, all I have to be concerned about is showing up. This entry was posted in American Library Association, Atlanta, Black Caucus of the American Library Association, Black History Month, conference, Historically Black Colleges and Universities, Library News, libspotlight, LIS Staff Interest, lisblog, Middlebury Community Interest, middpoints, National Conference of African American Librarians, Post for MiddNotes, Post for MiddPoints on August 17, 2017 by Katrina Spencer. 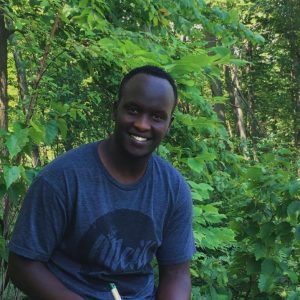 This entry was posted in climate change, Help Desk, Library News, libspotlight, LIS Staff Interest, lisblog, Middlebury Community Interest, middpoints, Post for MiddNotes, Post for MiddPoints, School of the Environment, Wilson Media Lab on August 7, 2017 by Katrina Spencer.